» Anybody here speak English? Albany’s plan goes way beyond bilingual signs like this one at City Hall. If someone needs help in Albany but can’t speak English, you would try to find someone who can interpret, right? That’s common courtesy. It’s also the law when it comes to public services. But as with almost everything, simplicity goes out the window when the federal government gets involved. LEP stands for “limited English proficiency,” and that the plan is aptly named is demonstrated by a sentence like this one: “The City of Albany follows four factors that apply to the various kinds of contacts that the public has to access language needs and decides what reasonable steps it should take to ensure meaningful access for LEP persons.” Huh? How does one follow a factor? The gist of the plan is simple enough. 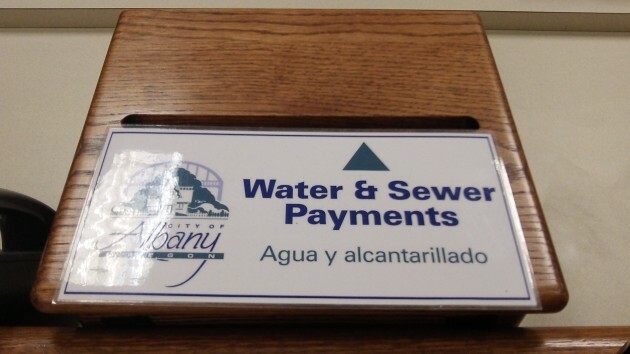 If city employees — a cop, say, or someone behind the counter at the parks department — run into someone who has no English, the employees will try to determine what language the customer does know. Unless it is obvious, they’ll whip out a language identification card that asks the customer in 38 different languages, from Arabic to Yiddish, to put a check mark next to the one he reads or speaks. Once the language is determined, the city will make an attempt, within reason, to find someone who can interpret or translate. All this is spelled out in bureaucratic detail and tortured prose in the city’s 15-page plan (18 pages if you count the sample of the language identification card). But whether all the details can really be carried out is hard to say. For instance, it says that if someone gives the city seven days notice, the city will provide an interpreter at a public meeting. At no cost, by the way. For generations now immigrants and parents of limited English children have been aware that living in the US means that English must be spoken to survive and thrive economically, no matter how many bilingual signs surround them. Given this historical fact, government mandated LEP plans/programs are probably a gigantic waste of money and effort. And this doesn’t mean that government should dictate the “official” language. I shouldn’t be forced by government to interact with you in English, Spanish, or Ojibwe. Free markets and the economic incentives provided will determine what language we converse in, or whether we converse at all. Well, how about ballots printed in foreign languages(s)? One must be a citizen to be qualified to vote. To be a citizen, one must demonstrate proficiency in the English language. Therefore why should we need to pay for ballots printed in a foreign language? And that doesn’t even begin to get to the issue of how could one be an educated voter if one cannot understand, read, or write in the common language of our country. The obvious solution is to make English the official language; then the onus of proficiency devolves onto the individual instead of the public. While working at the Oregon Employment Dept., multiple language support was readily avaialble via phone call to interpretive services. It took a few minutes to make the person-to-person access, but was well worthwhile for the person needing the service and the service we were trying to give. Not rocket science for sure. On-line capabilities are improving rapidly and will be even less of a perceived problem in the future IMO. How about simple equal rights. Treat non English speakers the same way English speakers are treated in their country. With the limited travel I have had in Europe and Central America, your comment translates to “better”.